LARSON ASKS AMB. 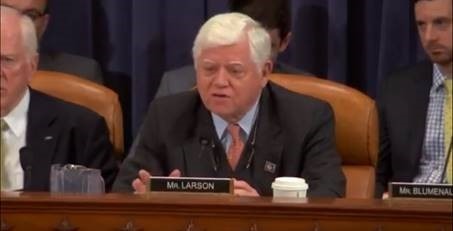 LIGHTHIZER FOR CLARITY ON EFFECTS OF TARIFFS ON CONNECTICUT MANUFACTURERS - Jarvis Airfoil, Inc.
Washington, D.C. – During today’s Ways and Means Committee Hearing on the United States trade policy agenda, Rep. John B. Larson (CT-01) asked U.S. Trade Ambassador Robert E. Lighthizer for clarity on the effects of the Trump Administration’s steel and aluminum tariffs on manufacturers in the First District. “What is the timeline for exempting countries? And what type of alternative arrangements are you seeking from those countries? Do you plan on making these decisions on all the exemptions by the time the tariffs go into effect which… would be Friday. So, you can imagine the intensified concern that this creates about the large supply chain, not to mention of course the manufacturers themselves in general. I’m wondering if you might give us more clarity on that,” asked Larson during the hearing. Larson pointed that the First District is home to a large manufacturing base that is comprised of hundreds of small and medium sized manufacturers who make up the supply chain and are downstream users of steel and aluminum. One such supplier, Jarvis Airfoil in Portland, CT, manufactures fan, compressor and turbine blades and vanes for jet engines, and has expressed concerns about the effect the tariffs will have on their company. Larson pressed Ambassador Lighthizer to provide clarity on the timeline for when the tariffs will take effect and how the exemption process will work. Ambassador Lighthizer answered that the hope was to get these issue resolved by April. His full answer can be viewed here.